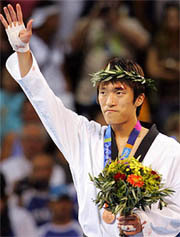 ATHENS, Greece — Korea won one gold and one bronze medals in the taekwondo competition of the 2004 Athens Olympic Games Aug. 27, 2004. Iran also won one gold medal on the second day of the four-day taekwondo competition. Korea's Jang Ji-won clinched the gold medal in the women's under 57kg class as she managed to brush aside the stiff challenge from Nia Abdullah of the United States on points 2-1. Jang, 24, scored one point in the first round and three in the second, but had two points deducted after receiving four warnings or Kyonggos. The bronze medal in the women's category went to Mexico's Iridia Salazar Blanco as she defeated Spanish Sonia Reyes on points 2-1 in the repechage final. In the men's under 68kg final, Iranian Hadi Saei Bonehkohal downed Chinese Taipei's Huang Chih Hsiung on points 4-3 to grab the gold medal. 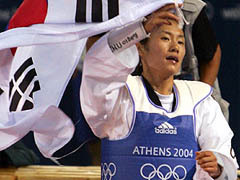 Saei Bonehkohal, the bronze medalist at the 2000 Sydney Olympics, scored one point in the first round, two in the second and three in the third, but had two points deducted after receiving four kyonggos. Korea's Song Myeong-seob earned his country the bronze medal in the men's class by outpointing Brazilian Diogo Silva 12-7 in the repechage final. On the opening day of the taekwondo competition Aug. 26, Chinese Taipei swept two gold medals. Two gold medals are also at stake in Aug. 28 taekwondo competition.